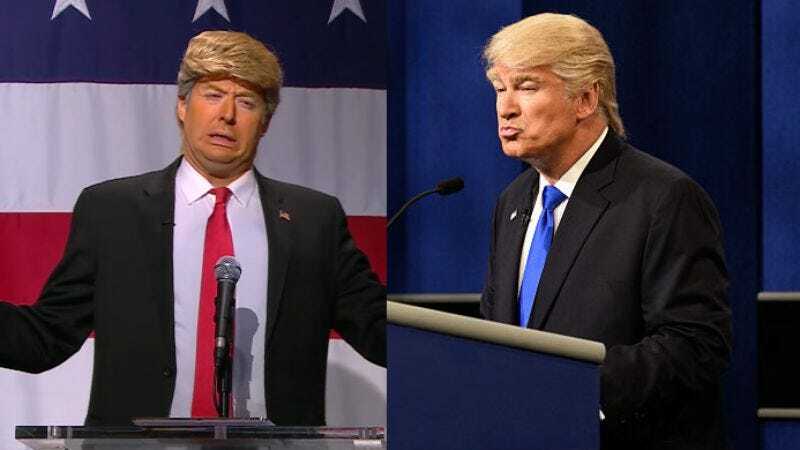 It’s infectious, apparently: Two high-profile Donald Trump impersonators—Alec Baldwin, who plays the president on Saturday Night Live, and Anthony Atamanuik, of the popular Trump Vs. Bernie stage show—are now fighting on social media, just like their muse. The Twitter arguments began after Baldwin went on Jimmy Kimmel Live! a few nights ago to talk about his impression, during which he joked about fellow Trumpersonators “lobbying” to play the president at the White House Correspondents’ Dinner, now that Trump himself has said he isn’t going to go. James Adomian, the Bernie Sanders to Atamanuik’s Trump, then joined the fray by accusing Baldwin of plagiarizing the take, provoking his own war of words. As previously noted, nobody has actually offered anybody the job of playing Trump at the WHCD—this is all just hypothetical. Still, we can’t help thinking there’s an easier solution to this problem than proving who’s the Trumpiest Trump there is on Twitter. As multiple Twitter users have pointed out, there’s no reason not to just bring everybody down to D.C. and fill the Correspondents’ Dinner with dueling Donalds. It’s like people always say: You can never have too much Donald Trump.